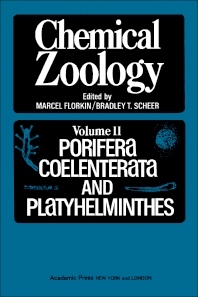 Chemical Zoology, Volume II: Porifera, Coelenterata, and Platyhelminthes presents chemical information on zoological significance. This book is organized into three sections; each section deals with the biological and biochemical aspects of the specific phylum. The first section examines three large classes of Porifera, namely, Calcarea, Demospongiae, and Hexactinellida. It describes the skeletal structure, pigments, nutrition, digestion, composition, intermediary metabolism, and hibernation of Porifera. The second section covers the classification, pigments, feeding response, digestion, nutrition, ecology, pharmacology, and intermediary metabolism of Coelenterata. The last section is devoted to the classification, nutrition, digestion, respiratory and intermediary metabolism, growth, development, and culture methods, as well as the chemical aspects of ecology of Platyhelminthes. This book is an invaluable resource for zoologists and biochemists.